If you want to see the right shape for an economic recovery, have a look at Turkey. In 2009 the nation suffered its worst recession on record – its GDP shrank roughly 15 percent year-over-year in the first quarter of last year (see red line on chart below). But since that bottom, Turkey has bounced back with a V-shared recovery – in the fourth quarter of 2009, GDP grew 6 percent compared to a year earlier. The domestic market was the key – strong consumption growth (light blue bar) more than made up for a slight decline in net exports (dark blue) in the quarter. Among the G-20 group of industrial nations, Turkey was second only to China in its GDP growth in the fourth quarter. The chart also shows some of Turkey’s neighbors in emerging Europe and how they are mending their economies after the Great Recession. 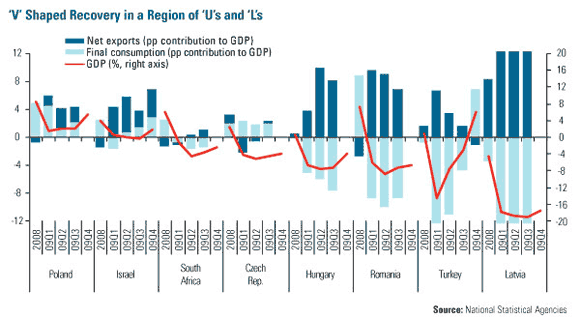 In both Hungary and Poland, the recovery is U-shaped, while the Czech Republic, Romania and Latvia are trending sideways in an L-shaped pattern. Turkey’s growth pattern is likely to continue to stand out in the region. In addition to a vibrant export economy, growing household consumption is likely to play a significant role in the recovery in 2010 as Turkey can hope for more domestic demand stimulus than other countries.